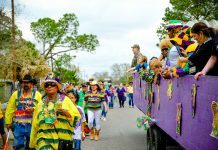 This month Travel with Terri is coming to you in real time. As I write this I’m sitting in my room at the Hard Days Night hotel in Liverpool where I’ve just returned from a Beatles concert. 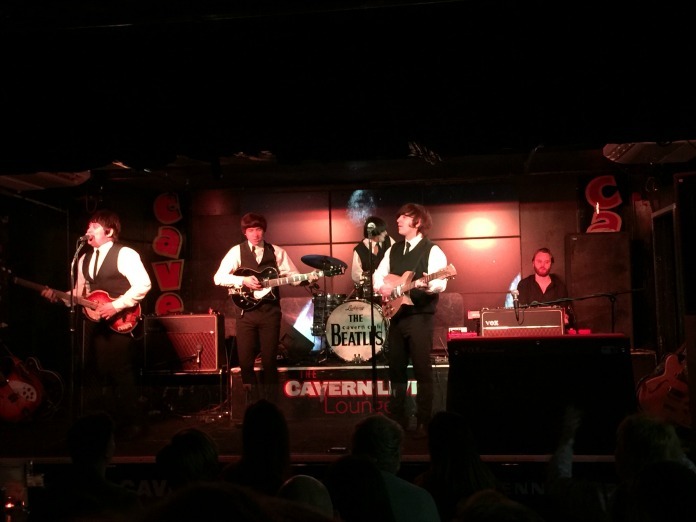 OK, obviously it wasn’t a real Beatles concert but it was the next best thing – Beatles impersonators playing live at the world famous Cavern Club where the boys from Liverpool launched their incredible career. That’s as close as anyone can get to a Beatles concert in 2016. Hanging out with a legend outside the Cavern Pub. I arrived in the home of the fab four today and have been swept off my feet. Liverpool is a city of growth and grit – a rare combination that somehow works. First let’s talk about John, Paul, George and Ringo who were born during the bombing blitz of World War II. They came into the world at one of the least desirable periods of history where food rations were normal and constant fear prevailed among the adults. They crossed paths as young teens and ultimately formed what became one of the most famous bands in pop culture history. 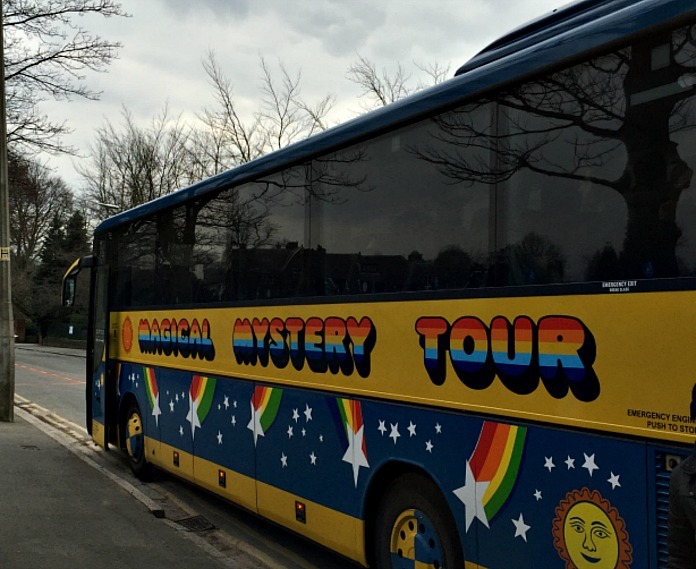 Today their story is told through a Magical Mystery Tour aboard a psychedelic bus. I can be a bit cynical about tourist bus tours, but I happily climbed aboard the psychedelic bus humming a Beatles tune in my head. I must admit it was fun having my picture taken by the Penny Lane sign, seeing the shelter in the middle of the roundabout, the barber shop, and the fire station. We even saw the grave where Eleanor Rigby was buried with her name – although the Beatles claim that was not the inspiration for the lyrics (seems unlikely to me). 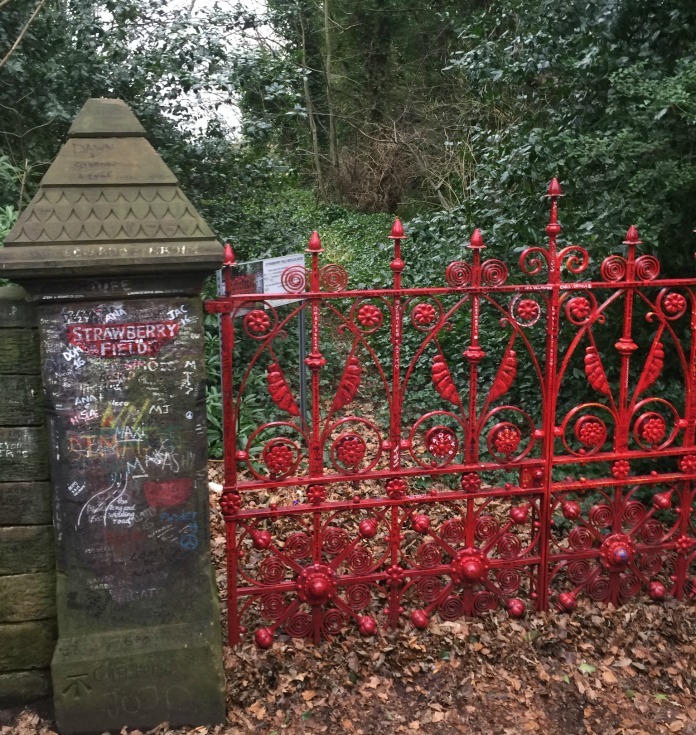 And, of course, Strawberry Fields was one of the most popular stops. 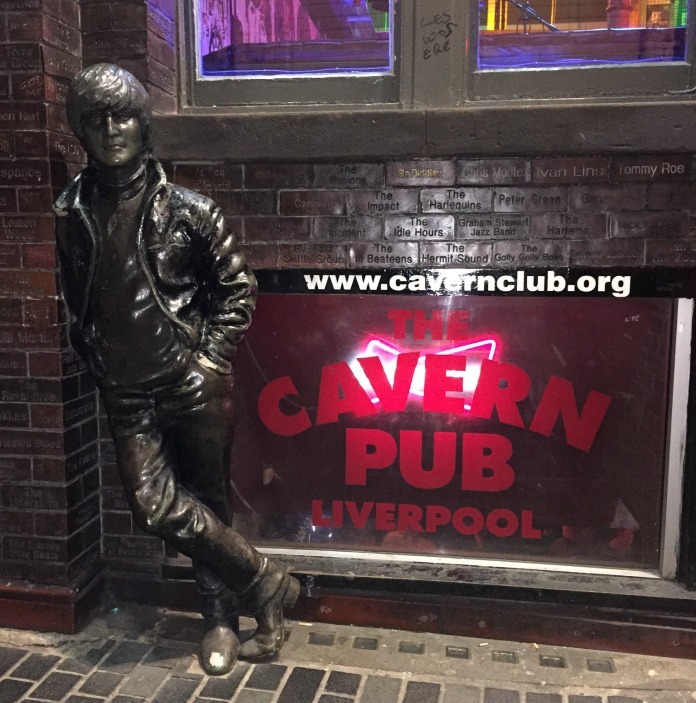 In between photo ops, the tour guide shared anecdotes of the life of John, Paul, Ringo, and George from the days when they roamed the streets of Liverpool. At the height of the Beatles popularity in the mid-60s, I was a just a child but their songs are forever in my head – I knew all the lyrics to every song. And when the Beatles tribute band took the stage at the Cavern Club it was obvious that those iconic songs are in everyone’s head. People ranging in age for 20 to 75 all sang along. The Beatles aren’t the only story in Liverpool. You’ll find plenty of tourists perusing the shops and attractions at Albert Dock. Others spend their time shopping the designer stores in the shiny new cosmopolitan shopping center, Liverpool One, in the heart of the city center. But if you want to see the real and often gritty side of Liverpool, a secret tour is a must. 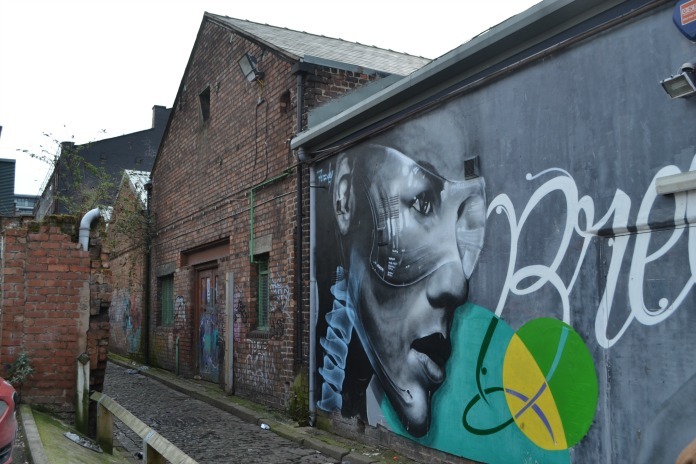 Seecret Tours of Liverpool will take you on a walking tour to discover the city’s street art, hidden attractions and alternative sights. We met up with our energetic and incredibly knowledgeable guide, Niko, and ventured out. The route started with a walk through the aforementioned Liverpool One which set the stage for the contrasting side of the city we were about to encounter. Niko showed us the “Sailors Gate” originally constructed in the late 19th century in an effort to trick drunken sailors into entering the sailor’s home in time for their 10:00pm curfew. (Some things never change!) From there we left the shiny new Liverpool behind to step into history at Bluecoat Chambers. 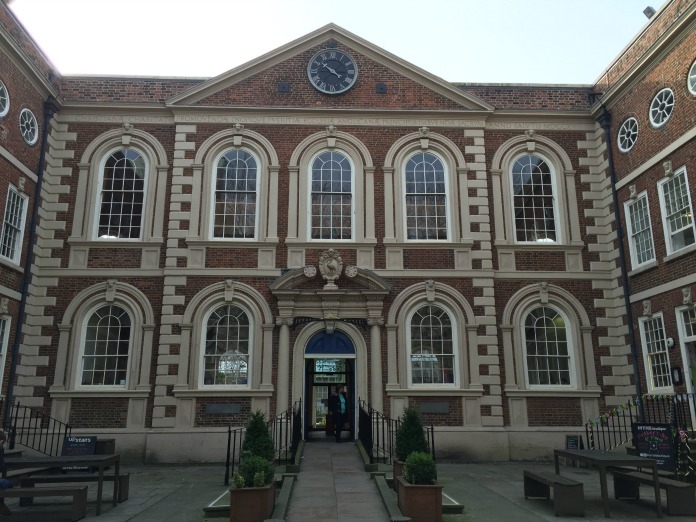 Built in the 1700s, the Bluecoat was originally a charity school and is the oldest building in Liverpool’s city center. 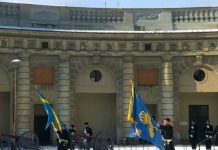 Today it houses a creative community of artists showcasing visual art, music, dance, live art and literature. The secret garden behind the building is home to independent businesses ideal for finding the perfect non-touristy souvenir. Niko also pointed out the Liver Bird – the city’s symbol. This mythical bird carved above the doors and iron gates of Bluecoat carries seaweed in its beak and has origins dating back to medieval times. The real story of Liverpool came alive for us as we entered the Ropewalks. Named from the craft of rope-making for the ships that dominated the city until the 19th century, Ropewalks is characterized by long parallel streets built to allow rope manufacturers to lay the ropes out lengthways. 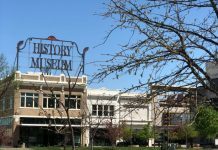 Remnants of bombed buildings from World War II still stand as a poignant reminder of the city’s difficult past. Numerous warehouses now converted to bars and clubs have become the center of nightlife for Liverpool. In fact, the recent Rough Guides “50 Things to Do Before You Die” ranked a night out in Liverpool’s Ropewalks quarter as #3 – just above the Great Wall of China. Street art masterpiece by Cranio. 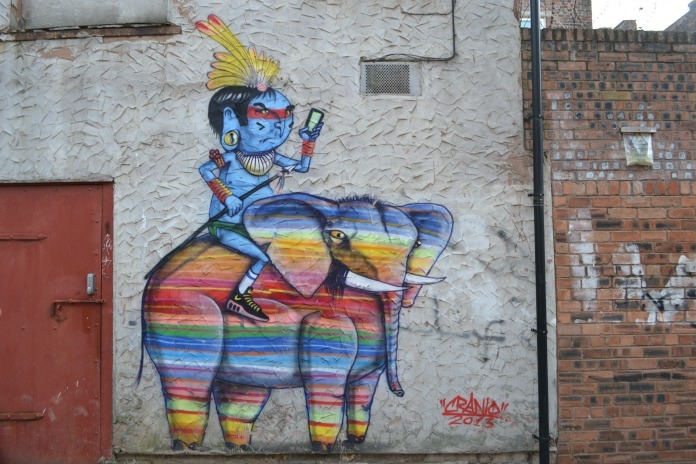 What was most impressive about this quarter of Liverpool was the street art. Niko introduced us to thought provoking graffiti masterpieces by Brazil artist, Cranio. Another amazing piece depicting the message “Breathing is Not Living” covers the side of Liverpool’s first dry bar, The Brink, opened by a recovered alcoholic to provide an alternative night spot for those who prefer not to imbibe in the spirits. The Brink is a recovery social enterprise with all profits going back into the community to fund support for those who have suffered through alcoholism and addiction – a story all its own! And, finally, no visit to Liverpool is complete without a stop at Maggie May’s on Bold Street for homemade Scouse – a beef or lamb based stew with carrots, onions and potatoes served with crusty bread. Scouse is also the nickname for the people of Liverpool who really do have their own version of the English language.